Our elegant selection of lavender and light yellow roses. This flower arrangement is a gift that can turn an ordinary day into something truly special. Every rose bouquet is meticulously picked and arranged by our supplier. The roses are delivered during bud stage so that your recipient can enjoy watching them bloom. Each stem is preserved in water with its very own floral tube to make sure it gets to you in perfect condition. The bouquet is packaged in supple non-woven wrapper with matching accent ribbons. You may also choose from our different packaging themes to reflect your own personal taste. The package comes with a greeting card which you can personally write to express your deepest affection to your recipient. 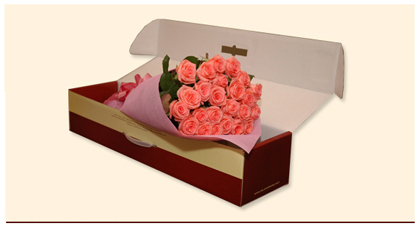 Lastly, the roses are placed inside a stylish shipping box which is specially designed to get your flowers safely to your destination.